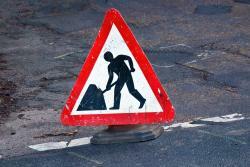 Resurfacing of Earlston High Street will get underway next month. The works on the section of the A6105 road will take place from Wednesday 1 to Friday 10 August for eight days, with the route fully open on Saturday 4 and Sunday 5 August. Phase one will see a section of the eastern end of the High Street closed for three days from 1 to 3 August, from 8.30am to 5pm each day, which is required due to health and safety regulations. Phase two will be carried out using a convoy system from Monday 6 to Friday 10 August, from 8.30am to 5pm each day. The official diversion is via the A68, B6362, A697, A6089 and A6105 for eastbound, with the reverse route for westbound traffic. Parking restrictions will be in place on the High Street during the works from 8am to 5pm. Parking restrictions will apply where no waiting cones are in place. Preparatory works are currently being carried out in advance of the resurfacing programme, with temporary traffic lights in place. Staff will be on site during the works to assist traffic and deliveries will be accommodated where possible. Letters will be provided this week to households and businesses affected. From Wednesday 1 to Friday 3 August, service 60 will divert from Earlston bus stance via the A68 to Lauder, B6362, A697 to Greenlaw. Service 60 from Greenlaw to Earlston will follow the same diversion. During this diversion a demand-responsive shuttle bus service will be provided by EAJ Robertson to connect with service 60 at both Earlston and Greenlaw for customers affected by the road closure. This can be booked by calling 01361 882340. If you are connecting from a Borders Buses service 60, please contact EAJ Robertson in advance for journeys between Greenlaw and Earlston. From Monday 6 to Friday 10 August, a convoy system will be in place on the High Street that will result in the bus stance being closed to all services between 8.30am and 5pm. Alternative pick up/drop off points will be provided. Service 51/52 will pick up on the A68 in both directions and will omit Earlston town centre. Service 60 will pick up and drop off on the A68 and will travel through the roadworks but not serving any bus stops on the High Street until Earlston Primary School. Borders Buses advise passengers to expect delays on service 60 during the works. “Earlston High Street is an important route not just for local residents and businesses but as the A6105 is one of the main roads from the west to the east through the Borders. “This resurfacing programme will vastly improve the road in Earlston, and with only a short-term daytime closure required. Earlston High Street was identified as one of 32 key routes across the Borders requiring improvements, as part of a £2.6million resurfacing programme this year. The programme is predominantly funded by an additional £1.8m investment announced as part of our budget in February 2018 to target road repairs across the region in 2018/19. We have also committed to investing over £22m in roads and bridges over the next three years, with £79m planned investment over the next ten years.